What once was a small beach resort, with a cool little bar and restaurant is now the biggest beach club on Koh Samui. One might assume with it's rapid evolution and expansion, the old charm may have been lost but it has maintained the chilled, fun and hip atmosphere that brought 1000's of tourists to this bar, the chilled lazy days and partying nights are as good as they ever were if not better. 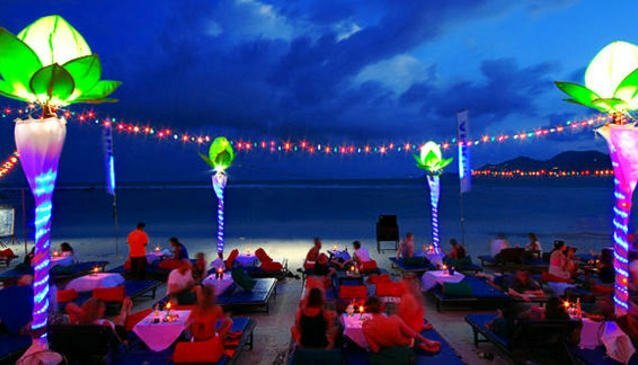 They now have 2 beach front restaurants and 3 bars where you can 'eat, drink and meet' while enjoying the sun or under the stars while lounging on Thai style cushioned benches. If you prefer the shade, and entertainment, you can enjoy a game of pool or catch the latest live sporting events at the inside dining area. The restaurant's menu is fairly extensive, you might want to enjoy a drink, while your deciding on fresh local barbecued seafood, an imported juicy steak, authentic Australian chicken parmagiana or some of the tastiest Thai cuisine Chaweng has to offer. On most nights you'll find DJs spinning the latest Uplifting and Funky Vocal House tunes. The Beach turns in to a dance floor at the weekly 'Wednesday Beach Party' and 'Funky Friday Beach Party' The atmosphere is fun and friendly and there is enough room for everyone to enjoy at their own pace, as a party hard participant or chilled observer. The staff are proper hosts, you'll always get great service with a traditional Thai smile. The food is good, the atmosphere fun, and the tunes compliment the scene. When you come to Samui, you have to experience a day or night at the infamous Ark Bar. We'd expect your first will not be your last! Open: 7 am - 2 am Daily.